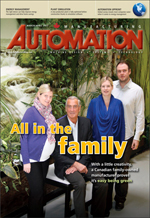 Manufacturing AUTOMATION columnist Ian Verhappen will become the new managing director of Yokogawa Canada. Learn more. North American robotics companies enjoyed one of the industry's strongest opening quarters ever, according to new statistics released from Robotic Industries Association, the industry's trade group. Get the numbers here. The Harper government plans to help build a strong manufacturing sector through promoting innovation and jobs, according to finance minister Jim Flaherty. Learn more. AIA, the association representing vision suppliers, system integrators, users, researchers and consulting firms from 32 countries, has released its first-ever study of the worldwide machine vision market for cameras. Get details on the study. Erik Meijer has been promoted to the newly created position of president, Bourns Electronics, where he will be responsible for overseeing the company's various business segments. Learn more about Meijer. Renishaw, a provider of measurement, motion control, spectroscopy and precision machining products, has purchased R&R Sales LLC, a provider of fixtures for the global measurement and inspection market. Learn more. As the economy begins to rebound, companies serving the automotive industry must find ways to maintain productivity and profitability — often with fewer employees than before the recent recession. A large part of maintaining that productivity is to ensure high levels of uptime in robotic welding operations. Learn more.